Pete Davidson appears on 'Saturday Night Live' with Lt. Commander Dan Crenshaw, a congressman-elect from Texas, November 10, 2018. 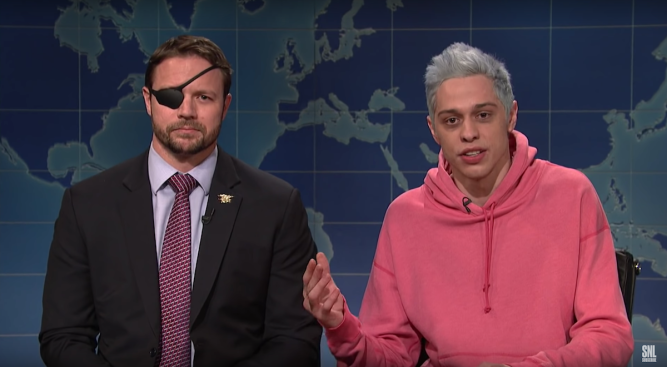 Newly elected Texas congressman Dan Crenshaw said he reached out to "SNL" star Pete Davidson over what he called Davidson's "devastating" Instagram post over the weekend, NBC's "Today" show reported. Davidson, 25, had alarmed fans and friends after sharing a message that seemed to suggest he was having suicidal thoughts. Davidson, who has been candid about his struggles with depression and borderline personality disorder, then deleted his account. New York police performed a wellness check and the comedian appeared briefly on Saturday's "SNL." Crenshaw told KPRC2 Houston that he talked to Davidson on Sunday. "We don't go back very far. We're not good friends," Crenshaw said. "But I think he appreciated hearing from me. I told him everyone has a purpose in this world. God put you here for a reason. It's your job to find that purpose. And you should live that way." Crenshaw and Davidson first made headlines after Davidson poked fun at the former Navy SEAL's appearance. Crenshaw lost his eye in an IED attack in Afghanistan. They pair appeared together Nov. 10 on "Weekend Update" where Davidson apologized for his remark. If you or someone you know is at risk of suicide, please call the U.S. National Suicide Prevention Lifeline at 800-273-8255, text TALK to 741741 or go to SpeakingOfSuicide.com/resources for more additional resources.